Growing up in southwestern bush Alaska and being raised at a sportfishing lodge with a fleet of 3 beavers (s/n 509, 613 and 1119) I literally learned to fly before I learned to drive a car. So I am a certifiable Beaver junkie. I was really stoked when the FG beaver came out with N471PM colors as I have seen this one up close and personal in Southeast. However after building the first two models I was always bothered by a few nagging details that were not really true to scale. The first most obvious change is that I redrew the art to extend out to the cowling as in the real "Big Papa", the original model always looked a little half done with the art terminating at the white cowling, so it has new lines and an anti-glare patch. The second fix is that in the original the white trim is painted in the wrong layer on top of the lines drawing, thereby painting the door lines out, I fixed that. Also sometime after the original bird was sold by mech air and purchased by Carlin Air it had an aditional sling seat portal put in, hence the extra two square windows. (Most rebuilt beavers have ditched the single round "seasick" portal in favor of larger squared off ones). There is no dorsal fin, instead I drew up finlets on the h-stab and put them on because most beaver pilots discovered some time ago that the dorsal gets knocked off when tailed into the beach and waves cause her to rock, also the dorsal makes it really hard to get underneath and push off the beach with your back. 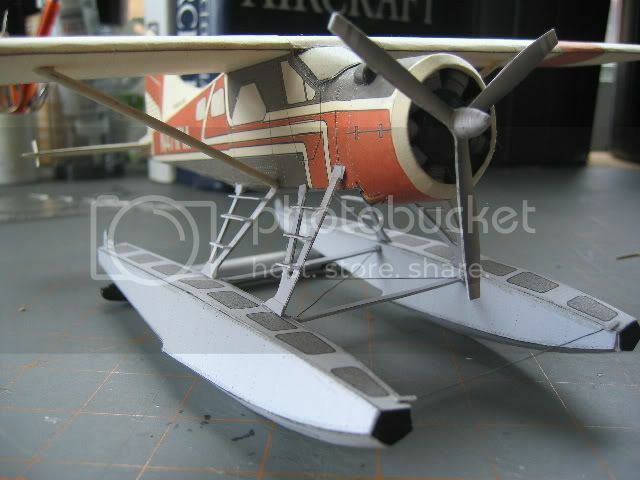 Repainted the prop, repainted the window color (not a big fan of blue windows), repainted the main glass trim, added rivets to the wing struts, and fixed the color value difference between the wings and fuselage (one was orange the other was red), drew up actual cylinders and made a 3D radial engine. Lastly I added the subtle "Carlin Air" text that is currently on the v-stab of "Big Pappa" and repainted the floats to a more oxidized "aluminumy" like color (although it comes out blue in the pics) and removed the red prop zone stripes from the floats as it is no longer seen on most beavers. Just one more thing that gets chipped and has to be repainted every other year. I'd send it into Chip but I think I departed too much from the FG format for him to approve. Sorry for the book I'm long winded... build tips in a follow up post. Last edited by DryFly on Wed Apr 25, 2007 7:03 pm, edited 1 time in total. 1) In order to get a more rounded cowling ring look to the edge: make lots of very tiny cuts with a sharp x-acto around the inside lip, paint with thinned glue and roll it under with your finger tip. 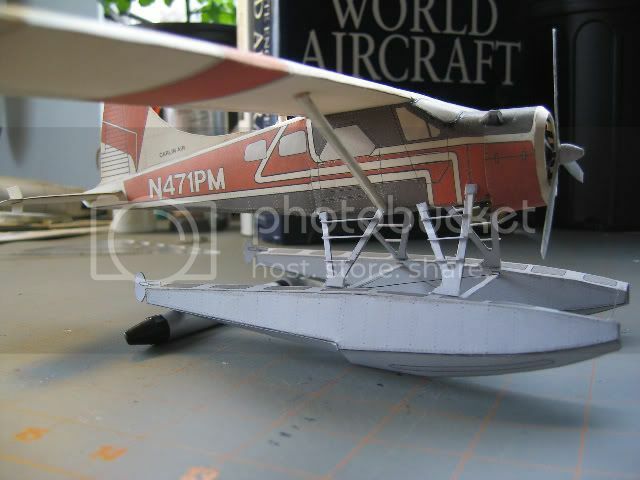 2) Dont use toothpicks on the float struts, they are too thin and the toothpicks show, instead laminate the struts unfolded onto another sheet of stock, cut out then fold and they will come out plenty stiff and thick at four layers. 3) Two scarf joined (glued end to end on an angle) round toothpicks work great for the wing struts, glue on the crease and wrap around for a semi-airfoil. 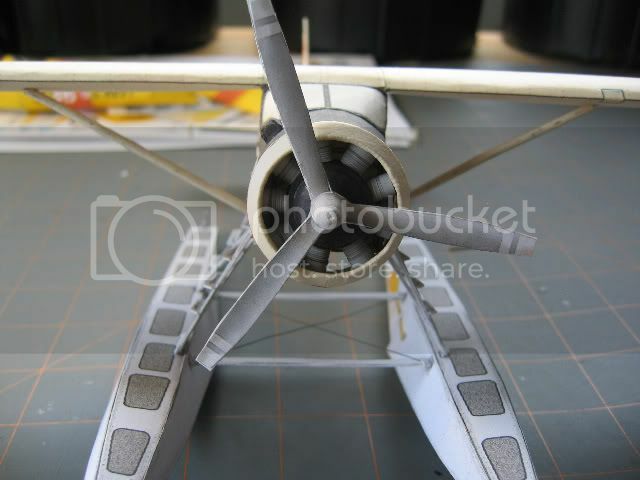 5) When gluing the wings to the center section place the cabin top piece in place and use as a reference for pushing the wings together, if you use the lines as drawn on the center section there will be a gap. 6) Most beavers on floats today do not have a dorsal fin instead they use finlets for the same anti-yaw effect. 7) Wrap the beacon light around a round toothpick and cut off flush when dry, then you will not have a hole in the top and you can color it red. Glue the float struts to the fuselage first in the basic form and let them thoroughly dry, it is still fiddly to get them all joined up but less so if the are already on the plane instead of on the floats. 9) Folded pieces of stock look better for stairs than toothpicks. 10)Most beavers on floats only have one paddle, located port side just aft of the third strut. And on that note since this is an Alaskan plane there is a slight error in the comments about the paddle being used to beat off the bass...there are no bass in Alaska so we prefer to use it to beat off the BEARS. 11) Little drops of 5 minute epoxy applied to the underside of the flut strut joints with a bamboo skewer, after they are tacked on with your favorite white glue really stiffens up the whole lot. 12) If you want a cleaner joint between the cowling ring and the cowling itself, try cutting off the tabs and instead creating your own by gluing 1/8 x 1/16th pieces of stock to the lip of the cowling leaving 1/16th sticking out for new tabs (spave them about 1/4 inch apart), then when you apply the cowling ring it will mount flush and smooth and not stand proud of the cowling. 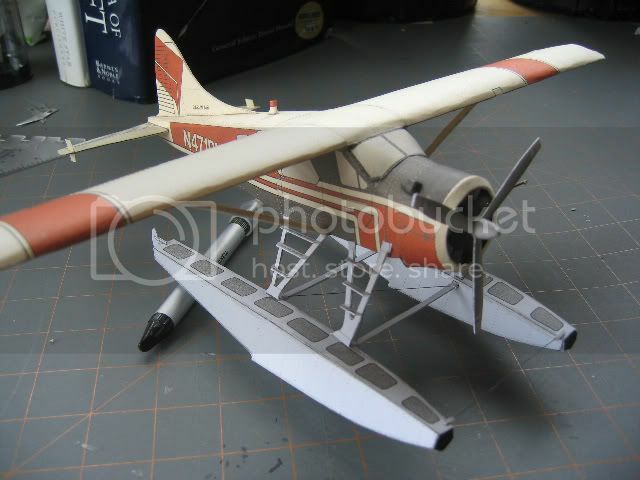 The same can be done for all of the fuselage tabs but it is more challenging for the beginning builder. Send the repaint to Chip, it deserves to be in the beaver folder. A bit of advice, send the repaint into Chip and ask him to comment on it, that way he can point out any differences between your format and FG's format and next time you can repaint in the way FG prefers. Your repaints are stunning, don't let the differences deter you, Chip is really helpful when it comes to the FG format. Iâ€™m just getting started in aero card modeling and surfing around the forum this morning I ran across your posting. Thanks for sharing the pictures of your outstanding Beaver and great documentation. Helps us ham fisted rookies get up to speed faster and gives us something to shoot for showing us what can be done. Really love your subject too as the Beaver on floats has always been one of my favorites. Will have to get one in my FG folder soon! Hi everyone im new to board. I designed and painted the original beaver paint scheme. The first one I did was on the yes bay lodge beaver N4787C. you can google that and theirs lots of history on crashes etc. - colors are jade green and dark brown metallic . after I painted the beaver white in the Ketchikan air hangar I came up with the scheme right out of my head and did no sketches at all. 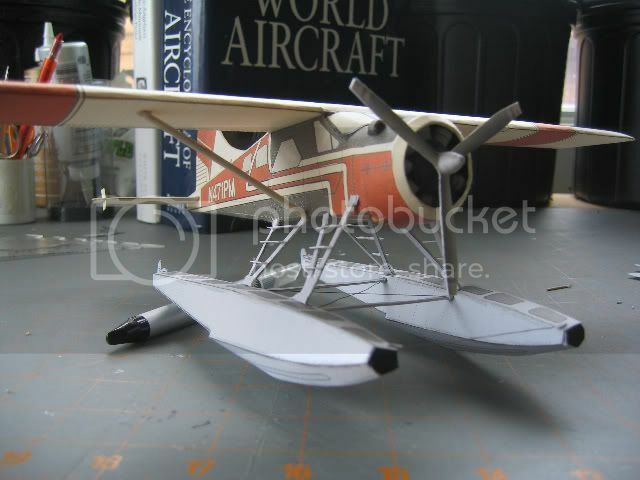 I looked at the beaver and was thinking I wanted to make it look sleeker by putting horizontal bands through the cabin area and eliminate the appearance of the windows. the tail design is also mirrored on the underside of the wing tip tanks. The vertical tail design is slightly curved on the top. the top and bottom stripes fan out wider tward the trailing edge this makes it more elegant. copies from different painters have lost this important detail. back then no decals for lettering. You can also see how rounded I made my curves on the green stripe around rear window. Hey there! Welcome to the forum and what a way to introduce yourself. 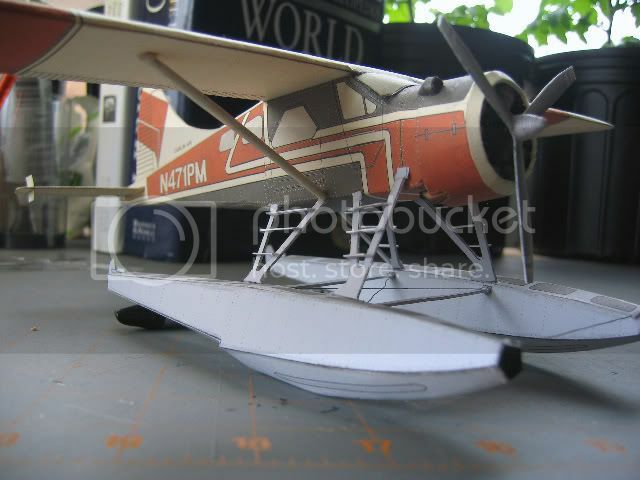 It would be awesome if you would do paper versions of your 1:1 scale work. Sorry i missed this when you posted. Real life and work are getting way too in the way of the paper world.